Our most interesting observation is that the two largest registries in terms of the number of advertised ASes (ARIN and RIPE) have shown distinctly different growth trends since 2001. Both registries showed exponential growth until mid-2001, but since then ARIN’s AS count has grown linearly while RIPE’s has continued to grow exponentially, though with a smaller exponent than in the pre-2001 period. 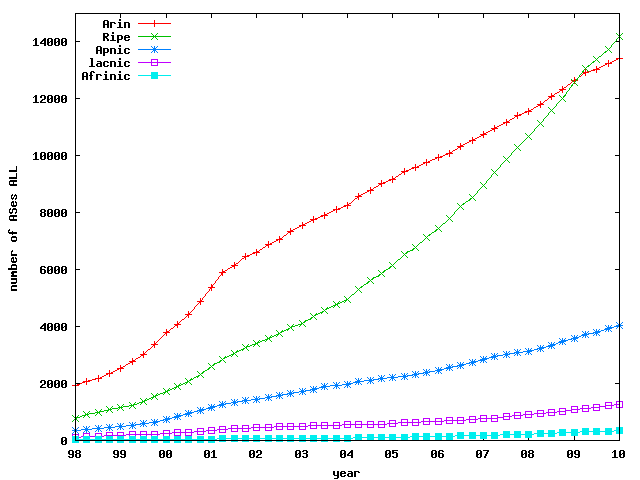 The number of advertised ASes allocated from RIPE is now larger than ARIN’s. We conjecture a couple of possible reasons for the shift. One possible contribution is the presence of companies in Europe that assist enterprises in obtaining Provider Independent (PI) address space and AS numbers. RIPE Labs’ Forum published a recent discussion of this issue. A second, related factor is the inclination of enterprises to seek PI address space (and ASNs) in the first place. The primary objective of enterprises in obtaining an ASN and PI address space is to multihome — connecting to multiple upstream providers for reliability, performance, and other traffic engineering goals. A larger concentration of Internet Exchange Points (IXPs) and more competition in the European transit market could make multihoming more attractive for enterprise customers in Europe than in North America. Measurements in our IMC 2008 paper confirm that the transit market is now larger and more dynamic in Europe than in North America. But we cannot absolutely confirm this theory directly with BGP routing data, since only networks with ASNs show up in BGP, and the majority of customer ASes (both in Europe and North America) are multihomed (otherwise, technically, it should not need an ASN in the first place). It would be illuminating to examine whether enterprise customers that did not request an ASN in North America would have pursued ASN + PI address space if they were in Europe, simply because the competitive transit market in Europe makes multihoming more attractive? This entry was posted on Friday, May 7th, 2010 at 4:55 pm	and is filed under Commentaries, Future, Policy, Topology. You can follow any responses to this entry through the RSS 2.0 feed. You can skip to the end and leave a response. Pinging is currently not allowed.